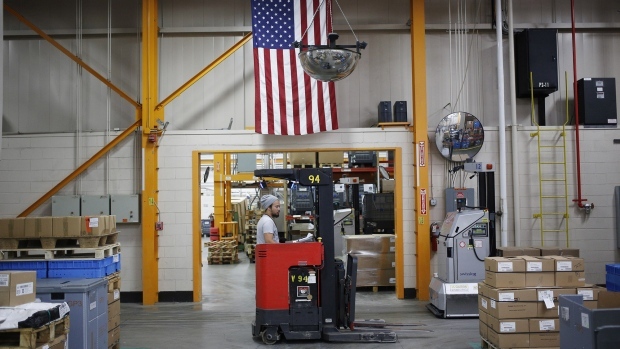 Manufacturing output was unchanged from February after falling a revised 0.3 percent, Federal Reserve data showed Tuesday. That compared with the median estimate for a 0.1 percent increase in Bloomberg’s survey of economists. Total industrial production, which also includes mines and utilities, fell 0.1 percent, also trailing forecasts for a gain and following a 0.1 percent advance. The data signal further manufacturing softness as producers cope with an inventory buildup, continuing uncertainty around trade and a dimming global growth outlook. The International Monetary Fund last week cut its forecast for the world economy to the weakest level since the financial crisis, though the Fed's patient approach to raising interest rates should support U.S. expansion. Production of motor vehicles and parts decreased 2.5 percent, the second decline in three months, to the lowest level since July. Excluding the sector, manufacturing output rose 0.2 percent after a 0.5 percent decline the prior month, with gains in industries including primary metals, computers and electronics and aerospace and other transportation equipment. The data echo some other reports on the sector. Regional Fed surveys for New York and Philadelphia have broadly been cooling in recent months. Capacity utilization, measuring the amount of a plant that is in use, fell to 78.8 percent, the lowest since July, from 79 percent. Utility output rose 0.2 percent after advancing 3.7 percent the prior month. Mining production fell 0.8 percent, while oil and gas well drilling rose 0.3 percent. Machinery production rose 0.5 percent, while output of consumer goods fell 0.2 percent, and business-equipment production rose 0.4 percent. The Fed's monthly data are volatile and often get revised. Manufacturing, which makes up about 75 percent of total industrial production, accounts for about 12 percent of the U.S. economy.